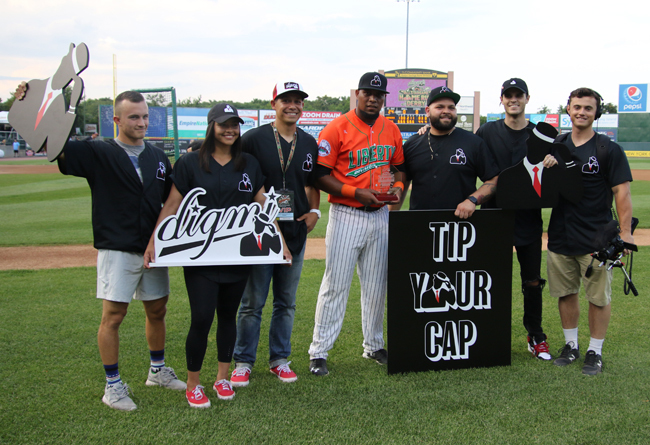 (Central Islip, N.Y., July 11, 2018) – New Britain Bees infielder Deibinson Romero claimed the Digmi Home Run Derby championship prior to the 2018 Atlantic League All-Star Game, presented by Good Samaritan Hospital Medical Center. The first-year Atlantic Leaguer batted fourth in the first round of the competition and launched a pair of home runs. That total was good for the second-most in the round. Long Island Ducks outfielder Lew Ford led the way with three home runs in the semifinals, while Ducks infielder David Washington, Lancaster Barnstormers outfielder Blake Gailen and Southern Maryland Blue Crabs outfielder Cory Vaughn each hit one. In the tiebreaker, Washington clubbed the only homer to advance to the championship round. Romero batted second in the finals after Washington led off and went homerless. The Bees infielder, who has clubbed nine longballs this season, proceeded to launch three home runs to jump out in front with only one hitter to go. After Ford failed to go deep, Romero was mobbed by his Liberty Division teammates for claiming the Digmi Home Run Derby championship. All three players that advanced to the finals faced pitches from Ducks/Liberty Division manager Kevin Baez. The three Freedom Division participants faced York Revolution/Freedom Division manager Mark Mason. The Digmi Home Run Derby preceded the 2018 Atlantic League All-Star Game, the league’s 21st Annual event. The Home Run Derby and game were both held at Bethpage Ballpark in Central Islip, N.Y., the home of the Long Island Ducks. Among the emcees for the event were Ducks broadcaster Michael Play and all-time Ducks legend Ray Navarrete, who is the franchise’s all-time home runs leader with 137 and participated in three Atlantic League Home Run Derby competitions during his career.